This episode, to me, is the purely fun romp that Crackers Don't Matter really isn't at its heart. There are so many funny moments and the humor is wonderfully character-based. This episode, to me, is the purely fun romp that Crackers Don't Matter really isn't at its heart. Much as I have nostalgia for Crackers Don't Matter, yeah, I'd have to concede that. I didn't find it as quotable though, which may be why it's never the first one I think of when I want to try and sum up Farscape. It's the Skeksis! Are there Gelflings nearby? The Skeksis always jump to the forefront of my mind when I watch this episode, though I was when I first watched it and still now remain, completely baffled by the mouth and jaw design of the creatures...which seems that after eating something they have to hope none of it falls through the gaping hole that is their lower jaw. The angel wings were a nice touch. I enjoyed this episode so much more than the previous one, and perhaps more so because of the previous one. I do think we got to see evidence that Ben Browder can perform a bit more subtle British/Sebacian accent courtesy of Aeryn's control of John's body. So kudos to you, Mr. Browder. This episode rang as opportunity for various physical and vocal imitations of the different characters and I found Chiana's head tick just as kind of annoying when Simcoe did it in D'argo's form. Speaking of Chiana....again, is it pretty symptomatic of her Flight versus Fight reflect that she's ready to high tail it off of Mora in D'argo's body and at the same time, tried to convince Rygel in John's body to leave as well? That, in my opinion, is awful on two levels: 1) She's leaving her friends to die without trying to help and 2) She's permanently depriving two of them of their bodies, even if they do somehow survive. This may have been the worse case of Chiana's character/personality quirks coming through as seen so far in the show. The fact that it ends with her and D'argo's relationship progressing, when poor D'argo doesn't know that she almost left him to die and in Pilot's body at that....ARGH. The next worse thing we have to wait a season or two to happen. 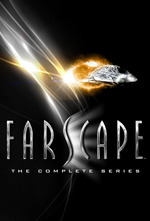 Ugh let's not talk about the Worst Farscape Plotline/Character until we get there. I love Zhaan's hand trick. Great moments: John (in Aeryn's body) coaching Rygel, in John's body, how to pee. Chiana in D'Argo's body propositioning Rygel in John's body. In the companion book, Anthony Simcoe said that he and Ben Browder did not rehearse that scene and used a lot of physical improvisations. I also love John and Aeryn wrestling in command after they're back in their own bodies, and Aeryn's line "I was in your pants," with that look! Great line: Have we sent the "Don't shoot us, we're pathetic" transmission yet? Obviously, one of my favorites!